Bring a new level of sophistication and modernity to your dinner parties with this finely-crafted wine glass rack. With 6 scrollwork hooks and a spiraling metal structure, this rack is not only useful for storage but also for decoration. A wide-rimmed metal base keeps the rack upright and firmly balanced. The 6 metal hooks turn in a circle for convenience and accessibility. Display this rack on your dining table or your kitchen counter to offer wine glasses to family or friends during parties or events. Approximate Dimensions (in inches): 10.25 W X 13.75 H X 9.75 D.
A wine glass storage rack made of metal with a black finish and an elegant scrollwork design. 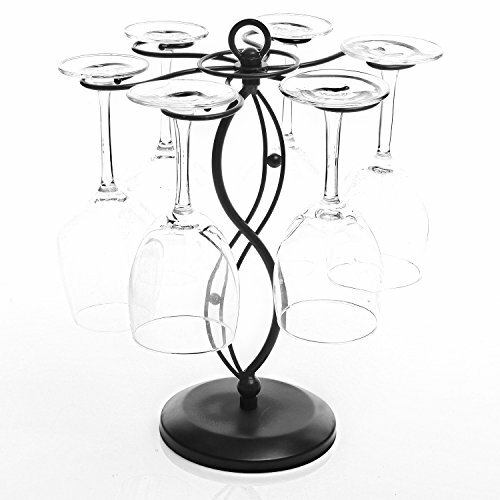 Features 6 curved wine glass hook that are designed to rotate on the central pole. Ideal for setting on any counter or tabletop to store your stemware and keep it within easy reach for family members and guests.